Halloween is one of my favorite holidays because it coincides with the change of seasons and it doesn’t matter if you like the Fall aspects or if you like the Spooky aspects… there’s plenty of Halloween inspired cocktails to entertain with. I’ve linked to some of my favorites that I’ve tried before. growing up in a small town, when you trick or treated in our neighborhood, my stepmom would offer mulled wine to the parents and if they didn’t exactly like the warm mulled wine, my dad would step in and offer the parents a solo cup with a bit of scotch. I don’t think our house was popular just for the candy and the corner lot on a busy street after all. I carried on that tradition when we moved away and it’s a thing. If you have a lot of trick or treaters and you see those fellow parents out there pounded the pavement for their little ghouls and goblins. Hand them a cocktail! Or mocktail if you’re not into alcohol. Caramel Apple Sangria - This one is so easy and is a huge crowd pleaser. 2. Sparking Cranberry Orange Eyeball Punch - Sweet and tart and just creepy enough. 3. 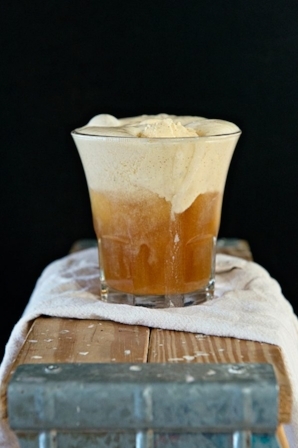 Hard Cider Pumpkin Ale Float - Hard cider is getting more and more popular these days - why not put some gelato in it for a float? 4. Zombtini - this one sounds sweet and perfect for a Walking Dead viewing night as well as Halloween. 5. FrankenPunch - this one is a sweet pineapple lime margarita as a sherbet punch. Sounds like it might be a dangerous one.